The Political Economy of China’s Great Transformation consists of three parts: first, covering the current political transformation, providing a general political background for the socio-economic, fiscal and urban and rural transformation. The book analyses the economic transformation and addresses the shortcomings of existing interpretations of the "Chinese Miracle" and develops a new multi-dimensional framework. In addition, it shows how the private sector has been developing and what a major role it is playing in pushing forward the overall economic development. 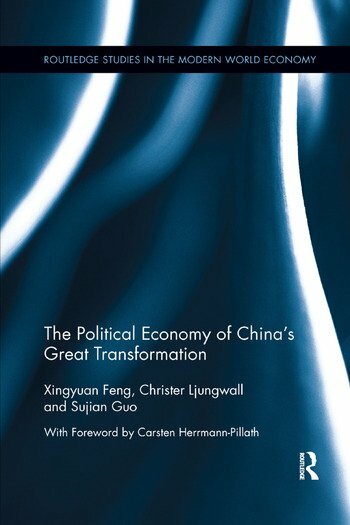 The book also focuses on the analysis of China’s fiscal transformation. With the set of refined principles of fiscal federalism that the author has developed, it examines the problems of Chinese fiscal federalism in contrast to them. It further elaborates on topics such as the local government debt and explains why further reforms are necessary, making this book a very comprehensive read to understand China’s progress. 3. Re-interpreting the "Chinese Miracle"
Xingyuan Feng is Professor and Vice President of the Cathay Institute for Public Affairs in Beijing. He received his PhD in economics from the University of Witten/Herdecke, Germany. Christer Ljungwall lives in Beijing and works for the Swedish Agency for Growth Policy Analysis, as Science and Innovation Counsellor, Head of Office of Science and Innovation of the Embassy of Sweden. He is also Associate Professor in Economics at the Department of International Economics and Management, Copenhagen Business School. He has published more than 30 academic articles in English, more than 150 reports, and authored and contributed to 5 books. He received his PhD in Economics from Gothenburg University in 2003. Sujian Guo is Changjiang Scholar, Distinguished Professor at Fudan University, and a tenured professor at San Francisco State University. He is also Editor-in-Chief of the Journal of Chinese Political Science (Springer), Fudan Journal of the Humanities and Social Sciences (Springer), Executive Editor-in-Chief of Chinese Political Science Review (Springer), Co-Editor-in-Chief of the Journal of Chinese Governance (Routledge) and Editor of Rowman & Littlefield–Lexington’s book series "Challenges Facing Chinese Political Development." He has published more than 20 authored and edited books and more than 40 academic journal articles.